Every Christmas, for more than twenty years, the busy Oxford professor known globally as J.R.R. Tolkien sat down and crafted another installation of possibly his most intimate production: a series of illustrated letters to his own children. Despite the burden of being perennially behind on deadlines and career commitments, Tolkien took time to paint, draw, and compose characters and adventures intended for no audience other than his family – delightful scenes such as this five-tiered painting, accompanied by letter and detailed envelope. This morning’s meditation is not then upon the typical nativity scene, representing the natal gift of our Heavenly Father to us his earthly children, as celebrated around the world on this date. It is rather a reflection on a visual and narrated gift from an earthly father to the children of his heart and home, at a very busy time of year. Tolkien’s gift is a personal and professional sacrifice of that great commodity, time. It is a gift that partakes in the celebration of the Divine Nativity, that frolics in the Light of the Christ-story, yet feels no need to directly name or obviously reference the tether of its joy. 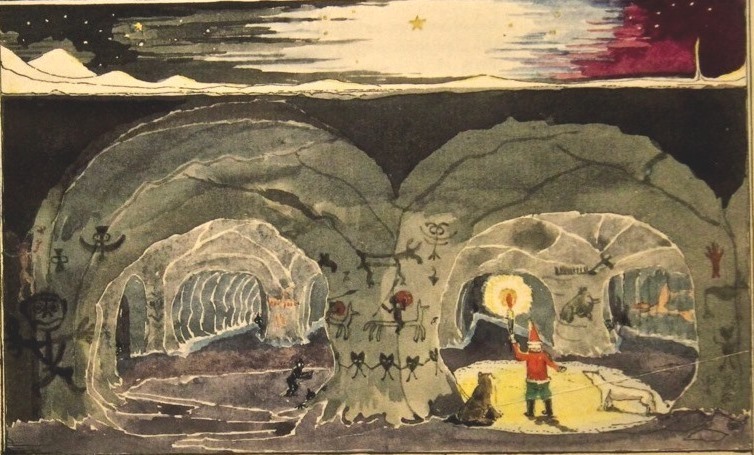 In 1932, the year of this painting, Tolkien’s children were already 12 years into the adventures of Father Christmas and his waggish assistant the “North Polar Bear,” Karhu. Karhu’s nephews, snow-men, cave-bears, elves, gnomes, goblins, and even the Man-in-the-Moon, ornament this terrain on which Tolkien developed his talent in visual artistry. 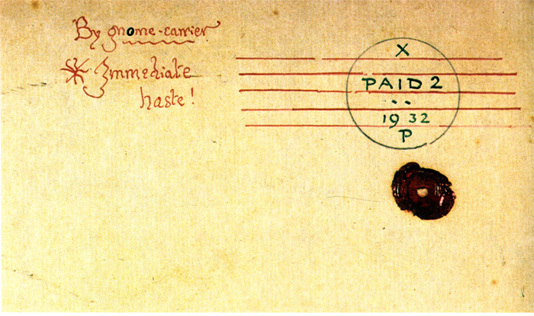 The paintings and drawings were accompanied by a letter inked in Father Christmas’ elderly and shaky hand, or occasionally in that of one of his scribes, and contained in beautifully addressed envelopes, complete with uniquely imaged stamps. Each year the children anticipated learning of more polar escapades, ones that often incorporated a Just-So element: explaining, say, the diminished number of toy trains, a particularly stellar explosion of Northern Lights, or (as the 1930s progressed) the nefarious effect that dispersed goblins were beginning to have on certain areas of continental Europe. In the next tier, one large bright star dominates an artic scene. The children – well-versed both visually as well as narratively in this snowy world – know that the tall structure on the far right is the North Pole, pointing up into the rosy constellation of Ursa Minor, the Little Bear. Belowground in the centre tier is an acknowledgement of both the evil in the world as well as the relentless triumph of good: Father Christmas and ‘Cave Bear’ have just rescued Karhu from dark goblins (a few still lurk in the shadows). The cavernous depths in which they found him, hidden below the tundra, are filled not only with goblin art, but with cave drawings from far more ancient times – mammoths and dragons, goblins and stags – many based on actual European cave art. The letter explains that whilst some of these drawings pre-date the existence of Christmas, others may be as recent as England’s Edward the Fourth. The next tier is of Father Christmas’ St. Stephen’s Day party (a reminder that Christmas is not a one-day event), held every year with his various helpers. Polar bears, cave-cubs, snow-babies, and gnome children dance with their host, who is adorned with a crown. This detail seems odd until it is remembered that St. Stephen – whose name literally means crown – is traditionally venerated as the first crowned martyr of Christianity. A small deliberate detail in Father Christmas’ attire. The last tier is simply the statement that underpins it all: “A Merry Christmas.” This is not a salutation, but rather a title, a declaration, signed with Father Christmas’ initials, NC – he has explained elsewhere that he is, of course, named after the gift-giving saint, Nicholas. 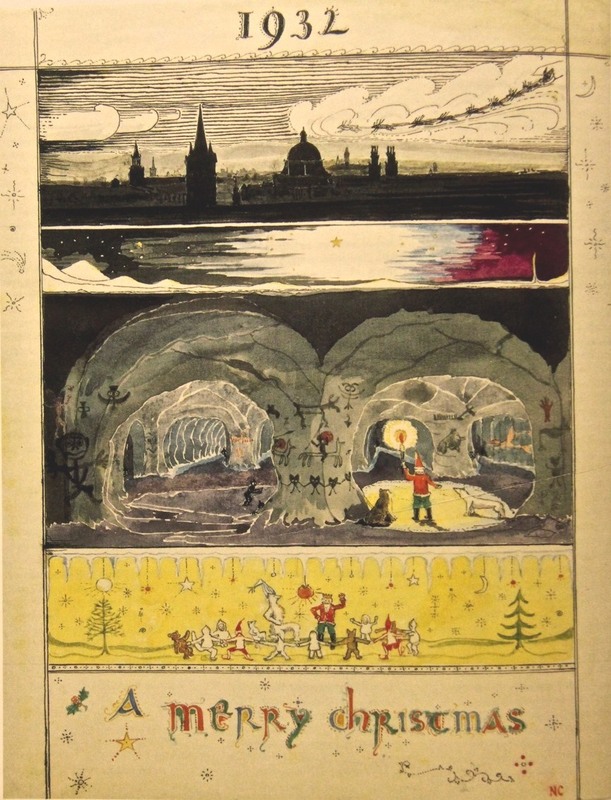 These scenes, this intermingling of time and place and story, the rescue in an ancient realm, followed by the celebration of one Christmas saint by the namesake of another, both preceded by the magical delivery of gifts right to the Tolkien children’s very town, their very home…this painted present of “A Merry Christmas” gave its recipients great joy. A Christian family committed to their Church, the Tolkiens knew the Nativity story well. Their father had played an integral role in convincing C.S. Lewis of its veracity: not only a riveting story, but a factually true one too. But being so rooted in that historic story, the entire family was able to delight in other tales redolent with the imaginative Natal Joy – intertwining their own story with many others. This was enabled by their father’s choice to set aside time from his usual work, and invest in his relationship with them through creative making; the Christmas gifting of one Father inspiring the gifting of another – by the painting of yet a third. A merry Christ’s Mass indeed. The seminal book on Tolkien’s art is J.R.R. Tolkien: Artist and Illustrator (HarperCollins UK, 1995) by Wayne G. Hammond and Christina Scull. Kirstin Jeffrey Johnson is a George MacDonald scholar, and a free-lance writer and lecturer on literature, theology, and the Arts based in the Ottawa Valley, Canada. Her doctorate (Institute for Theology, Imagination and the Arts, University of St Andrews) considered the concept of Mythopoesis as defined by Tolkien and Lewis and as attributed to MacDonald. She is an associate member of the Inklings Institute of Canada, and on the editorial board of the Inklings journal SEVEN. She also contributes to Patheos Public Square and the blog EverydayTheology.life. See www.kirstinjeffreyjohnson.com.